HOW TO BEAT A PRIVATE PCN: BY APPEAL, COMPLAINT, OR DEFENCE. PLEASE ONLY START A NEW THREAD IF YOUR QUESTION IS NOT ANSWERED HERE, OR IN OTHER THREADS YOU SEARCH FOR AND FIND FIRST, OR IF THE STAGE YOU ARE AT IS COMPLICATED (e.g. COURT CLAIM STAGE, DO POST AND SHOW US YOUR DRAFT DEFENCE, BUT READ POST #2 BELOW, FIRST). OR AT POPLA STAGE, DO SHOW US YOUR APPEAL DRAFT (BUT DO READ POST #3 BELOW, FIRST). PLEASE FIRSTLY READ OTHER THREADS LIKE YOURS, EITHER ON THE FIRST FEW PAGES OF THIS FORUM, OR BY SEARCHING FOR THE PARKING FIRM'S NAME. THIS FORUM IS VERY BUSY SO WE NEED TO CONCENTRATE HELP FOR THOSE WHO ARE AT A STAGE THAT NEEDS ASSISTANCE (NOT 'IGNORE THE DEBT COLLECTORS' STAGE! WE FIND THAT MOST POSTERS DO NOT NEED SPECIFIC HELP AT FIRST APPEAL STAGE. A - NO, BUT THEY CAN BE APPEALED. GO TO 'PEPIPOO.COM' COUNCIL TICKETS FORUM INSTEAD. A - YES, IT IS. SEE THE DATE LAST EDITED IN 2018 AS SHOWN AT THE BOTTOM OF THIS POST. A - THE CAB (SADLY) INVARIABLY GIVE TERRIBLE ADVICE ABOUT THESE CHARGES (HAVE EVEN DONE SO OFFICIALLY ON THIS FORUM), SO AVOID! A - THE USUAL ACRONYMS ARE EXPLAINED LOWER DOWN THIS THREAD, SEPARATELY, IN POST #5. APPEALING IS NOT COMPLICATED, YOUR APPEAL IS ALREADY WRITTEN FOR YOU BELOW FOR YOU TO COPY & PASTE INTO THE PPC's ONLINE APPEAL PAGE. AS THE FORUM IS TOO BUSY, PLEASE DON'T COPY THE TEMPLATE INTO A NEW THREAD AND ASK 'DO I SUBMIT THIS?' YES...! A - IF YOU ARE UNSURE, START A THREAD TO DOUBLE CHECK THE COMPANY NAME, BUT IF A PARKING FIRM IS NOT IN EITHER THE BPA OR IPC 'APPROVED OPERATOR' SCHEMES, OR ARE SHOWING AS CURRENTLY BANNED, DO NOT APPEAL AT ALL. THEY CANNOT GET YOUR ADDRESS AND YOU WILL NEVER HEAR ANY MORE! A - FORGET THE '14 DAYS JITTERS'. THE SO-CALLED 'DISCOUNT' IS A BRIBE NOT TO APPEAL - YOU CANNOT DO BOTH - BUT WE ACHIEVE 100% DISCOUNT IN ALMOST EVERY CASE. A - If it's PCM then give it a go as they seem to enter 'no contests' sometimes, but otherwise, no chance unless you have something ground-shattering like proof there are NO signs up, or if they've said you were the driver/keeper and you are neither (e.g. if you are a non-driving resident and appealed instead of a family member keeper/driver, then it can be fun to expose the PPC to that fact at IAS, proving you can't drive!). Normal appeal facts like 'I was not the driver, no keeper liability' don't cut it with the IAS which is deemed to be a kangaroo court, and losing that stage will make most posters feel worse, and more worried. SO DON'T! A - NO, THEY ARE NOT, AND PLEASE NO MORE THREADS ASKING THIS! The only thing to do differently with an INDIGO RAILWAY PENALTY (specifically only that type) is to WAIT for the first letter to arrive (as long as it's your own vehicle, not leased/hired) and do not rush to appeal on day 26 like with any other 'parking charge notice'. The reason is, these fake penalties go nowhere, and 'time out' after just 6 months. So at every stage, drag it out, and wait for the first letter before using the template appeal below. Then at POPLA stage - which is now available again for fake 'byelaws Penalties' like this one, don't rush. POPLA codes last 32 days, so appeal as late as possible and get to the six months and/or win at POPLA earlier by copying another byelaws POPLA appeal (search the forum). For a summary about Indigo Railway penalties, written by a newbie who did her research (BUT THIS WAS BEFORE POPLA WAS ALLOWED AGAIN FOR THESE CASES) click here. WHEN IGNORING IN SCOTLAND/NI, KEEP ALL LETTERS. DO NOT THROW THEM AWAY, FOR 5 YEARS. A - NOTHING! Unless this is the VERY FIRST letter (England/Wales) in which case, appeal as if it was the 'Notice to Keeper'. DO NOT RING THE DEBT COLLECTOR - DON'T TAKE THE BAIT! See post #4 below, please NO NEW THREADS RE 'IGNORING THE DEBT COLLECTORS' STAGE. A - IT IS NOT TOO LATE. WE WIN 99% OF WELL-DEFENDED COURT CLAIMS! CERTAINLY DON'T RUSH TO PAY OFF A CCJ, WHICH OFTEN DOES NOT REMOVE IT. THESE CAN BE BEATEN. SEE POST #2. See how easy it can be to get these cancelled by a retailer/hotel/landowner. VERY EFFECTIVE AND DAMAGES THE PPC! A - Private charges are based on contract law and allege either that the driver breached a contractual term (e.g. a promise not to overstay a 2 hour free period) or accepted an offer to park for a large fee (e.g. 'by parking here without a permit, you agree to pay £100 per day'). Such contracts can be enforceable in the county court, but are defendable (see post #2 all about small claim defences). These are the exact words used, so you should quote them to your MP in a complaint and ask him/her to contact Sir Greg Knight MP if he wants further information about this scam. Windscreen ticket from a BPA member? = STOP - wait and research before appealing!! If it was a windscreen 'PCN' (not postal, and not an Indigo Railway 'penalty' - see Q&A above) wait 3 weeks and in that time, you MUST check the firm is an AOS member with the BPA or IPC (GOOGLE & CHECK THEIR LISTS). In the case of CURRENT (NON-DVLA-BANNED) BRITISH PARKING ASSOCIATION (BPA) AOS MEMBERS ONLY, appeal online or by email at around day 26 after a windscreen PCN but as the KEEPER, not driver, using the ''one size fits all'' blue appeal template below. A - To tie them up in the appeals process at a time when they should also be posting a Notice to Keeper (NTK). Many PPCs in the BPA omit any NTK when replying to an appeal and the very fact a PPC forgets to send you a NTK by day 56, gives you a winning point at POPLA! Don't forget this tactic, and use it at POPLA stage: having appealed on day 25 or 26 after a windscreen PCN, make sure you take note of whether any postal NTK is ever received in the following weeks. A rejection letter with POPLA code is not a 'NTK'. You must include 'no keeper liability' at POPLA stage if you do NOT receive a NTK at all in that time, and you will win. In the case of CURRENT IPC AOS MEMBERS ONLY, we now advise to WAIT for a Notice to Keeper to arrive and then challenge once online or by email, as the KEEPER, not driver, using the template appeal for IPC members, as shown below. A: Because there has been shown to be no appeal worth trying really, you will get a rejection anyway, so you may as well leave it and see if they issue a NTK and let them apply to the DVLA (unless yours is a company or lease car of course, in which case you MUST appeal at windscreen PCN stage as stated at the end of this thread). Also, letting an IPC member get the data from the DVLA places obligations upon the PPC in the processing of that data which can have data protection implications for them if they misuse it (for example if they try to 'sell' the parking charge to a third party like MIL Collections). A postal PCN or NTK might be headed up 'Reminder' or 'Charge Notice' or it may even be a letter from a debt collector - it is your Notice to Keeper, in effect, if it's the first letter to arrive. No need to wait, if the event was in England/Wales, appeal online as registered keeper (or as ''hirer/lessee'' if that's the case, see * below re lease/hire cars). - if this is a BPA member parking firm, the point is to get a POPLA code if you do not get it cancelled. I dispute your 'parking charge', as the keeper of the vehicle. I deny any liability or contractual agreement and I will be making a formal complaint about your predatory conduct to your client landowner and to my MP. - If the allegation concerns a PDT machine, the data supplied in response to this appeal must include the record of payments made - showing partial VRNs - and an explanation of the reason for the PCN, because your Notice does not explain it. - If the allegation involves an alleged overstay of minutes, your evidence must include the actual grace period agreed by the landowner. If you fail to evidence the actual grace period that applies at this site or suggest that only one period applies, this will be disregarded as an attempt to mislead. In the absence of evidence, it will be reasonably taken to be a minimum of twenty minutes (ten on arrival and ten after parking time) in accordance with the official BPA article by Kelvin Reynolds about 'observation periods' on arrival being additional and separate to a 'grace period' at the end. - in all cases, you must include a close up actual photograph of the sign you contend was at the location on the material date. Should you later pursue this charge by way of litigation, note that service of any legal documents by email is expressly disallowed and you are not entitled to assume that the data in this dispute/appeal remains the current address for service in the future. THE NAME AND POSTAL ADDRESS OF THE KEEPER (OR THE HIRER/LESSEE) GOES HERE. THE DRIVER IS NOT IDENTIFIED. DO NOT PUT YOUR NAME HERE INSTEAD, IF YOU ARE NOT THE KEEPER/HIRER/LESSEE. YOU ARE NOT HELPING IF YOU DO THIS WRONG BY APPEALING IN THE WRONG NAME! DON'T POST IT BY ROYAL MAIL UNLESS YOU HAVE NO OTHER OPTION ON THE PCN. CERTAINLY NOT BY RECORDED DELIVERY - FORGET THAT! - ALWAYS USE THE ONLINE APPEAL PAGE - OR EMAIL IF OFFERED AS AN OPTION ON THE NOTICE - BECAUSE THE APPEAL CANNOT GET LOST AND YOU CAN KEEP PROOF/ A SCREENSHOT. NO NEED TO USE YOUR REAL SIGNATURE IF YOU HAVE NO OTHER APPEAL OPTION BUT POSTAL...BUT OF COURSE YOU PUT YOUR NAME AND ADDRESS! - the driver's receipts/bank transactions (or Hospital Appointment/Hotel booking, etc.) that day as 'they' were a genuine customer/patient, etc. - If an occupant of the car is disabled or elderly/infirm, then the keeper can add that, without implying who was driving. A copy of the Blue Badge (BB) is a good idea to upload/attach, but a person with a long-term debilitating condition (not a broken arm!) can be disabled without a BB, and will be legally entitled to a 'reasonable adjustment'. That can and should include an extension of time, over and above free or paid-for parking time. If the NTK arrives late, this does not make the PCN 'void' but it means there is 'no keeper liability' possible. If they are a firm which alleges 'keeper liability' under the POFA 2012 (which they don't have to!) the a postal PCN must arrive by day 14 if there was no windscreen ticket. Or, the NTK must arrive with you between day 29 and day 57 if there was a windscreen PCN. Some firms (e.g. Civil Enforcement, Highview, Smart Parking and some small PPCs) don't even bother with POFA 2012 wording so the keeper is not liable if you point that out to POPLA. In the case of a company car or hire car, if you get a windscreen ticket you MUST appeal before day 28 (well before day 21 when it's an IPC firm which only 'offers' 21 days to appeal - check the PCN). This is in order to hook the PPC in your direction, before they get a chance to get the keeper's details from the DVLA. You should also warn the owner/keeper (Fleet Manager) not to pay if they do get a letter about it because they have no business to get involved in a fake PCN you have already appealed as driver, and you won't reimburse them if they are daft enough to pay it. If the hire/lease co gets a postal PCN and names you as the driver/hirer, that is a good thing as it removes them from the loop entirely and then you can follow the above advice as appropriate to your case - but check and see if they have charged an admin fee. Challenge that admin fee with the Fleet Manager, Hire firm or your HR Manager, if your car use t&cs do not support this deduction for a mere invoice (as opposed to a fine/penalty). Thanks to Edna Basher for the template appeal for when it's a Hire/company/lease car and a postal Notice has been sent out, after the hirer/lessee/company car user has been named. Remember, that does not mean they have named the 'driver'! So stay schtum about who was driving! Last edited by Coupon-mad; 27-11-2018 at 2:53 PM. SMALL CLAIM? START A THREAD PLEASE (UNLESS YOU ALREADY HAVE ONE ABOUT THE SAME PCN) BUT PLEASE ONLY AFTER READING THIS AND DOING THE ACKNOWLEDGEMENT OF SERVICE ('AOS') FIRST. IF YOU HAVE AN OLD THREAD, PLEASE REPLY ON IT, DON'T START ANOTHER ONE. You can find out where to send the SAR (usually by email) by looking on the Parking firm's PRIVACY webpage, telling you where to send a SAR or any 'data concerns' to their Data Protection Officer. You should NOT have to supply intrusive ID like your driving licence or Passport, that's excessive - and if they are sending a LBC then they already hold sufficient data to ID you! - if the car park was Pay and Display, ALWAYS ask for a PDT machine record from that day, of payments made (VRNs can be partially redacted but insist on getting this and follow it up if they refuse). - and a list of all PCNs they consider are outstanding against you and/or this VRN, and remind them that any claim must be for all PCNs in one claim, not several separate claims. DO RESPOND - but DO NOT use the 'reply forms'. You do not have to declare your finances! As well as the SAR to the parking firm's Data Protection Officer (DPO), also write a letter - by email to Gladstones or BW Legal or directly to whoever the PPC is, if they are not using a solicitor. Your letter can state that you have sent their client a SAR and so you require a restriction of data processing and the case should be put 'on hold'. Confirm your correct 'address for service' (especially if you've moved and they've traced you & might revert back to an old address). This is an EASY formal letter to write - it will not stop most claims but it looks better to respond. Gladstones & BW Legal will refuse. Please don't post about that...all as expected. Do that email as well as the SAR, treat it as a last gasp chance to appeal, because ParkingEye can and will sometimes stop the case and revert to appeal stage, or they will accept you naming the driver & postal address (and will reissue the PCN and start again with the driver being allowed to appeal). Or send them relevant things you really should have sent earlier as an appeal - such as a copy of the Blue Badge of an occupant of the car, or a shopping receipt if over £30. ParkingEye WILL sometimes cancel the PCN at LBC stage. This is always a VERY good idea to complain to the Landowner or retailer, and LBC stage is your chance. When faced with a polite but ''angry customer who will never return'' complaint (no template, write it from the heart!) many retailers cancel these at commercial car park sites. If it's a Hospital, urgently complain to PALS (Google it...). What if your LBC-stage complaint to the landowner does not get the PCN cancelled? You will probably get a court claim anyway, so be ready. That's where we usually win! And the results of the SAR will help you, as it shows you their evidence nice and early and makes it easier to defend as you are not in the dark. If you get court claim, do not panic, we assist people & some 99% of cases here, win! ALMOST NO-ONE REPORTS A LOSS - YOU DON'T NEED TO WASTE MONEY ON A SOLICITOR OR ANY COMPANY - WE KNOW WHAT WE ARE DOING, WE HAVE A HIGHER SUCCESS RATE THAN ANYWHERE, AND WE HELP FOR FREE. So, where to start dealing with your claim? DO NOT START SCRAWLING A HALF-BAKED 'DEFENCE' ON THE PAPERWORK. STOP! NO NEW THREADS SAYING 'HELP WHAT DO I DO?' ABOUT BW LEGAL CLAIMS, PLEASE. JUST READ OTHER ONES FIRST...START A THREAD ONLY IF YOU DON'T ALREADY HAVE ONE, AND ONLY ONCE YOU HAVE READ AT LEAST TWENTY OTHER BW LEGAL DEFENCE THREADS. YOU SIMPLY DO NOT NEED ADVICE ON A THREAD FROM SCRATCH JUST BECAUSE YOU HAVE GOT A CLAIM. INSTEAD, TAKE A WEEK TO READ OTHER THREADS - THEY ARE ALL THE SAME - AND SHOW US YOUR DRAFT DEFENCE FOR COMMENTS. Urgently start your own thread - ONLY if you have no thread yet - if you do, please 'reply' with a court claim update on your existing thread if you already have an old one - and show us your own tailored draft defence and we'll assist on a case by case basis. You do not get a CCJ even if you lose; as long as you pay within 30 days of judgment it's all sorted and nothing stays on the register (i.e. your credit record). No 'risk' as long as you don't miss court deadlines, you may as well defend and fight. You will likely pay less than is being demanded even if you lose, all over with no effect on your credit rating - you will have cost THEM more. IMPORTANT - KNOW WHAT YOU MUST DO AND BY WHEN! Once allocated to your local court, PLEASE DO NOT NOTE THE HEARING DATE AND FAIL TO ACTUALLY READ THE LETTER! (b) photos proving the scarce and illegible small print signs in your case, a view showing the lack of entrance signs, etc. (c) a video of how it looks from a car is good evidence! You can get a passenger to hold a camera or phone and record the lack of signs seen. (d) a copy of Schedule 4 of the POFA - there is a link to it in post #1 above. The Judge will NOT have this to hand & is unlikely to be familiar with it. This is only applicable if you are defending as keeper. (e) a copy of Henry Greenslade's wording from the POPLA Annual Report 2015 'Understanding Keeper Liability' if defending as keeper. (f) a copy of your lease or tenancy agreement if this is an 'own space' or 'block of flats' dispute where YOU have primacy of contract. (g) the case transcripts that support your argument (get them from the Parking Prankster's case law page), e.g. if arguing prohibitive 'forbidding parking' signs which offer no contract a driver can accept, you need PCM v Bull; if arguing that this is a residential space where the tenant/leaseholder has already been granted (impliedly or explicitly) the right to park or unload you need Jopson v Home Guard (a persuasive Appeal case heard by a Senior Circuit Judge) and PACE v Mr N, etc. (h) the IPC or BPA Code of practice, where it supports your case (e.g. the grace periods section 13 of the CoP in a BPA few minutes' 'overstay' claim). (i) a Pay & Display ticket if you have it in such a case, e.g. if arguing it was displayed. DO NOT ARGUE 'no loss'! and if a firm does discontinue (e.g. CEL often do, rather than attend a hearing) then write & claim your costs! Court reports - what it is like when you turn up and win! A WS is simple, it expands on your defence and tells the story from your point of view, and it is vital because it includes your evidence exhibits such as photos of obscured/tiny font signs, any relevant letters, permit/copy of your lease, copy of your authority to park, etc. HAVE YOU FOUND OUT ABOUT A CCJ (JUDGMENT FOR CLAIMANT) AND NEED IT SET ASIDE? ...which includes the OP's statement in support of his/her set aside, and an outcome which included the £255 being refunded. They were in and out in 5 minutes and he/she just asked for the £255 to be reimbursed by the non-attending claimant (quite often they don't attend). And the Judge agreed, all over, claim struck out entirely! Usually the PPC does not turn up to a set aside hearing, but you must be well prepared and know what the Judge wants to hear, and also do ask for your COSTS (including your £255 fee if you do not qualify for help with court fees*) to be paid by the Claimant or at least 'reserved' pending the claim the continuing - and if the Claimant defaults on the court process, or discontinues (very common after a set aside) you want your costs paid! So make sure the Judge knows this is likely and to protect your costs by Ordering the dates by which the Claimant can continue the claim - but that they must pay your set aside hearing costs, in the event of a discontinuance. Last edited by Coupon-mad; 01-02-2019 at 11:32 PM. DO NOT APPEAL SAYING WHO WAS DRIVING, NEITHER AT FIRST APPEAL STAGE NOR AT POPLA. 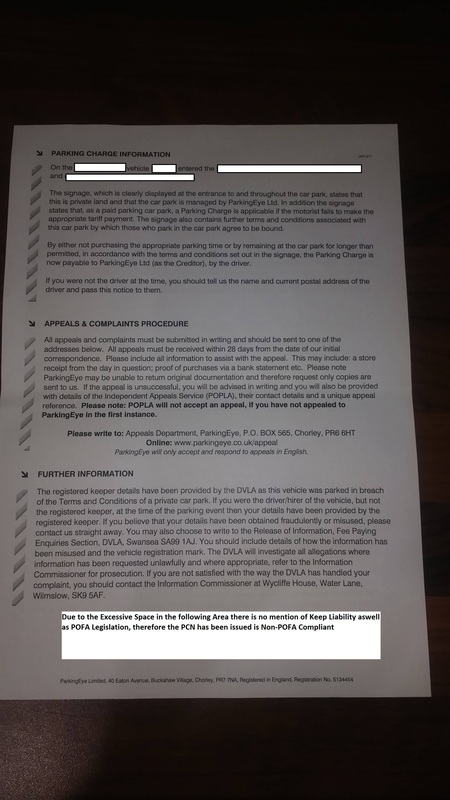 but don't feel you have to answer their questions, you should write a detailed appeal and attach it as a PDF along with photos (use the parking firm's own photo of the sign if the words are illegible and the £100 (or whatever) charge is not in LARGE letters. To find a relevant POPLA appeal written recently, always search the forum well, choosing good keywords. THAT IS WHAT A WINNING POPLA APPEAL CAN LOOK LIKE, VERY LONG AND WITH IMAGES. ParkingEye (make sure you search it as ONE word as shown) can be best handled by searching for the relevant place as a keyword, so 'ParkingEye POPLA Aire Street' or 'ParkingEye Tower Road POPLA' or 'ParkingEye POPLA Hospital' would be good choices of keywords to find very recent examples. ALWAYS look at the wording of any PCN from ParkingEye to see if it is a 'POFA/keeper liability after 29 days' one or not. There are two versions - look on the BACK of your PCN! ...then you *will* win your appeal using the template POPLA point about 'no keeper liability' from a PE non-POFA type PCN, followed by the template point about the appellant not being shown to be the individual liable. I have only shown a few links as examples of POPLA appeals because they change and evolve. Searching will find the most recent similar example; do not use one older than 2017. Do not look at old ones about 'no GPEOL' or no loss because that's not going to win. Easier than it sounds because we now have a number of POPLA appeal points covering the essential areas for appeal. They are in 'near template' state, but will need to be checked first against the circumstances of your parking event. These are long on detail and when put together form a formidable block of text, deliberately so to scare off some PPCs who cannot be bothered to contest (fairly common). A ParkingEye appeal is 100% winnable with that style PCN as long as you do NOT shoot yourself in the foot first by saying who was driving. These then get saved as PDFs and uploaded to POPLA under OTHER (ONLY) - do not think you only have 2000 characters in some box on the POPLA wepage! If the PPC contests the POPLA appeal, they will put on the Portal (and maybe also send to you) their POPLA evidence pack. It is NOT from POPLA not the decision! This is your chance to comment on the crappy evidence from the scumbags. YOU REALLY MUST COMMENT, BUT KEEP IT VERY CONCISE TO FIT COMMENTS IN THE PORTAL. How can I comment on the evidence sent to POPLA, they've written a lot and shown lots of pictures of signs?! Look through the evidence and find things to rebut - such as the signage being unclear, illegible, sparse/nothing to show how close the car was to a sign. Or the witness statement/contract being heavily redacted, out of date, not signed by the landowner, or even just that it shows no expiry date (POPLA seem to like that). Your comments are to rebut the operator's case, blow by blow. Do not re-write your appeal or call it 'an appeal' or POPLA will not read it. What will likely happen in the end, re my POPLA appeal? Do you have to pay of you lose at POPLA? No!! The 'IAS' offered by IPC companies is considered far worse than POPLA. It is named and shamed on forum posts regularly as a 'kangaroo court' because even a strong appeal loses in almost every case. The IAS favours the parking firms and expects a mountain of evidence from the appellant. Do not use mitigating circumstances. DO NOT, REPEAT DO NOT PAY £15 FOR THE 'BINDING' IAS VERSION! Please don't start a thread asking if you should appeal to the IAS unless you have very rare circumstances that might make yours worth a try. The answer is NO, do not try IAS at all. SO GET COMPLAINING, EVEN IF THE PCN WAS FROM MONTHS BEFORE. What will happen if I lose at POPLA or IAS? - you will most likely (unless it's a very litigious PPC) just get a series of hysterical 'pay up or else' debt collector letters, or maybe letters from the PPC themselves - see separate post about ignoring them, below. No need to panic. - you might have to defend this if the PPC tries a small claim, and they might be buoyed by an IAS 'win' under their belt to brandish. If that happens, see post #2 above about beating a claim! 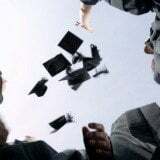 What will happen if I do not bother with the IAS stage? Same as the advice for those who lose. Don't pay. Ignore debt collector letters as per post #4 of this advice thread - except to tell them in writing (keep proof of posting/emailing) if you move house, to make sure you never miss court papers a couple of years later. Come back and read post #2 if you get a small claim, which defendants coached here win 99% of the time. Last edited by Coupon-mad; 26-07-2018 at 10:33 AM. CAN'T SAY IT ENOUGH, THIS IS NOT A FORUM FOR TALKING AD INFINITUM ABOUT DEBT COLLECTOR LETTER CHAINS SO PLEASE SPARE US!!!!!!! DO NOT START A NEW THREAD ABOUT DEBT COLLECTOR TEDIUM, PLEASE, JUST SEARCH AND READ WHAT'S ALREADY BEEN SAID. READ THIS CLICKY LINK (YES THE BLUE BIT, CLICK ON IT!) AND DO NOT, PLEASE DON'T, START A NEW THREAD ABOUT ROSSENDALES or DEBT RECOVERY PLUS OR ZZPS OR WRIGHT HASSALL! Debt Collectors letters or threats of court? Thinking you may be too late to appeal? You may get debt collector letters, e.g. 'Debt Recovery Plus' (also using trading names of 'PCS' and 'Zenith') or you might have 'ZZPS' or even solicitor letter heading from 'Gladstones' or 'Wright Hassall' which actually asks for payment to a debt collector = a debt collector letter then! THESE ARE NOT BAILIFFS, THEY CANNOT SEND THE BOYS ROUND! THIS IS JUST A LETTER-CHAIN YOU GET IF YOU HAVE NOT APPEALED. If you have letters from any debt collector such as Debt Recovery Plus or Zenith and are on the face of it, too late to 'appeal', then (if in England/Wales) either ignore them or robustly respond. To be clear - I recommend ignoring debt collectors, as the response leads nowhere - certainly NEVER ring them! IF YOU REALLY WANT TO WASTE HOURS ON IT THEN PLEASE NO NEW THREAD, JUST SEARCH THE PARKING FORUM FOR THEIR NAME AND MAKE A CUPPA AND READ ALL ABOUT THEIR SILLY LETTER CHAINS, AND EITHER SEND ONE ROBUST REPLY OR TOTALLY IGNORE THEM. I recommend the second option. KEEP ALL THE LETTERS IN CASE IT BECOMES HARASSMENT, OR IN CASE THE PPC EVER TRY A SMALL CLAIM. Last edited by Coupon-mad; 21-09-2017 at 8:49 PM. http://forums.moneysavingexpert.com/showthread.php?t=4766249 Look how easy it can be to get these cancelled by a retailer/hotel/landowner! Most fake PCNs can be cancelled if it is a retailer car park, simply by COMPLAINING! If you go for the complaint assertively and quickly you won't even have to bother with any of the above appeals/POPLA stuff! Look at the linked thread above - I have given typical contact emails in post #3 - for stores, and tips about who to moan at if it's not a shop on site. Also there's a template 'rant' of a complaint letter to give you the flavour of how angry a customer is entitled to be about this utter harassment, particularly if your only error was taking too long shopping! Retail Park with lots of stores? Google it and find the management or landowner contact details. Contact details for complaints to the BPA or IPC (as applicable to your PPC) and the DVLA below. Complain every time to the DVLA if your PPC are faffing around not sending you a POPLA or IAS code even if you appealed in time, or have breached the Code of Practice. AOS = Approved Operator Scheme of an Accredited Trade Association such as the BPA (or the new one, the IPC). AoS = Acknowledgement of Service (of a claim form). See the second post for the link showing how to acknowledge a claim. ATA = Accredited Trade Association (like the BPA or IPC, that means AOS members can get your DVLA data). BPA = British Parking Association, merely a Trade Body for its member PPCs (not a regulator & not on your side, however you can use them to complain). DPO = Data Protection Officer. Send a SAR to the 'DPO' for all data - check their Privacy page. IAS = a 2nd stage 'SO CALLED independent' appeal service, applicable in England/Wales for IPC AOS members only. Pointless. IPC = International Parking Community - merely a Trade Body for its member PPCs (not a regulator & not on your side). LBCCC/LBC/LBA = Letter Before County Court Claim/Letter Before Claim/Letter Before Action. DO NOT IGNORE IT. How to respond. MCOL = Money Claim Online - Google it! NTH = Notice To Hirer (if you are the hirer/lessee, e.g. hired or company cars). Easy to win! NTK = Notice to Keeper which should be the first letter sent to the registered keeper. See below for how to appeal if in England/Wales. POC = Particulars of Claim (the short paragraph on the left middle of a claim form, with very sparse facts). PPC = our forum shorthand only, for 'private parking company'. POFA 2012 = Protection of Freedoms Act 2012 (specifically Schedule 4 as linked below). England/Wales ONLY. POPLA = Parking on Private Land Appeals - a 2nd stage 'independent' appeal service, applicable in England/Wales and for BPA AOS members only. WS = Witness Statement. See post #2. If you have a claim, you must file a Witness Statement (and your evidence and exhibits) before the hearing, as well as the initial defence statement. Last edited by Coupon-mad; 04-12-2018 at 1:20 PM. This thread is for general information only. Please do not post questions about your parking tickets in this thread. Any posts made here will be archived to this thread. Last edited by Crabman; 13-10-2017 at 8:06 PM.